Last night, many of Smorgasburg's new vendors passed out their tasty wares at a preview night at Brooklyn's Berg'n. It was a delicious affair. Many meals were tasted, and while they were all great, here's five of our favorites that you should definitely try when Smorgasburg returns outdoors in Williamsburg (Saturday) and Prospect Park (Sunday) this weekend! And check out the full list of new vendors at the end of the post. This was a creation sent straight from the sandwich gods to my mouth. The dripping olive oil. The tasty sauces. The oozing eggplant. The perfectly pickled egg. There couldn't be a more divine lunch item. I can't wait to have another one Saturday. 2. Street eats at Jianbing Co. Watching this traditional Shanghai street food being made is a seductive experience in itself. A thin layer of batter is laid out wide on a circular skillet surface, while egg, beef, a perfectly fried cracker, scallions, cilantro and chili sauce is piled on top, then perfectly folded for an easy meal to eat on the go. This eggy delight may have gotten all over the place, but it was 100% worth it. A precisely boiled egg is placed gingerly on top of an English muffin with soft ricotta, tomato chutney and creamed chard. This will cure any hangover. I don't need much more than meat and delicous sauce to enjoy a meal in this life. Oni's chicken nuggets are delicious, and their gobo chips, made from burdock root, were a lot more tasty than most chips I eat. And I really like chips. 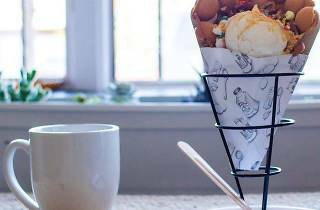 These egg waffles hail from Hong Kong and look like honeycombs, piled high with your choice of ice cream and toppings like mochi, oreos or fresh fruit. Waffle flavors will switch up each weekend, from matcha green tea and white chocolate chip to chocolate with bananas. Authentic Chicago-style Italian beef sandwiches served with provolone and sweet + spicy giardiniera on a roll. The name is play on the Chinese word “bao,” which means “baby” or “precious treasure” but also can mean “to be full with love or food.” #Baonanas specializes in banana pudding served by the scoop. Flavors include traditional banana, strawberry, s’mores, and matcha. The team behind Big Mozz is firing up Neapolitan pizza this summer. They worked with a family owned shop in Maine to create custom copper-clad ovens that reach 1000 degrees. They’ll also be hand-stretching their mozzarella for these extra fresh pies. Blank Slate Kitchen aims to create a line of professional-quality cooking ingredients for home cooks. Their first products are a line of rich syrups, made from palm sugar, including a Black Pepper Simple Syrup and a Bird’s Eye Chili Simple Syrup. BrunchStreet specializes in a common Chinese breakfast–quail eggs on a skewer. The variations at BrunchStreet, run by Kevin McGhee, a former sous chef at Eleven Madison Park, include the traditional sesame and cumin with chili sauce and more western flavors like truffle, Parmesan, and brioche. The Choripan is a well known street food from Argentina comprised of a grilled sausage served on soft club bread with chimichurri, lettuce, tomato, and mayo. The Choripan team make their own sausage using a family recipe from Cordoba, Argentina. Diego uses a recipe learned from his grandmother to produce chocolate in Guatemala, a tradition that spans thousands of years for producers in the chocolate belt. They purchase beans directly from small-scale, local farmers, and do all of the roasting themselves. They even color the labels by hand! Keeping things simple with cheesesteaks done South Philly style. If the name sounds familiar, it might be because Dave Fedoroff also runs the very popular Fedoroff’s Roast Pork stand that launched last year at Smorgasburg. Foraged and Found was started in Seattle by Chef Jeremy Faber and has since expanded to Boston and NYC. They provide over 100 restaurants in New York with mushrooms, ramps, fiddleheads and other seasonal finds. Their booth will be a destination for many home chefs. Based in Finland, Four Sigmatic makes mushroom coffee, hot cocoa, and tea. They want to make some of the most popular medicinal mushroom varieties, such as the chaga, reishi, and lion’s mane, more delicious for daily consumption. Familiar bodega sandwiches reinvented them with seasonal ingredients, elevated techniques and great names, like the Sando Calrissian. Jianbing is the quintessential Chinese street breakfast: a centuries-old wrap that’s both savory and sweet, with a distinctive crunch. Using recipes dating back to Kate Kooks grandfather’s rice wine brewery in Korea, the mother and son team behind Kimchi Kooks make small batch kimchi. In addition to the kimchi sold in jars, they developed a menu to showcase their fermented products, including kimchi mung bean pancakes and kimchi dumplings. Hailing from West Berlin, Kotti makes döner kebab, a German street food staple. The sandwich is made with marinated meat roasted on a spit, topped with vegetables and served on a focaccia-like bread. They’ll also serve an assortment of sodas made in Berlin. Kimchi made in Queens from Kyle’s grandmother’s recipe. Flavors include traditional, kimchi slaw and kimchi radishes. Kyle’s Kimchi joins Smorgasburg after a successful run at Smorgasburg Queens in 2015. Malai, our newest ice cream vendor, means “cream of the crop” in a North Indian language. They make flavors like Sweet Corn Saffron, Rose with Cinnamon, Turkish Coffee, and Orange Fennel. Oni Sauce make home-style Japanese food, such as karaage, Japanese fried chicken; gobo chips, shoestring thin chips made from burdock root; and gyu tataki, a seared beef salad. You can also take home a jar of their onion sauce or their hot chili oil, which they use in all of their recipes. With over 100 hives in Crown Heights, Jersey City and the Hudson Valley, Oh Honey Apiaries harvest and package raw, cold extracted honey. Oh Honey Apiaries started selling at the indoor market in Industry City. Pioneer Cannery makes pickles, jams, mustards, hot sauces and garnishes. Some of their specialties include Bloody Mary Tomatoes, Nopales (picked cactus), and Caramelized Onion & Tomato Jam. Inspired by Japanese mizu shingen mochi, the Raindrop Cake is a delicate, light cake made from barely solidified water and served with brown sugar syrup and roasted soy flour. Red Table wants to improve the reputation of the humble English muffin by making breakfast sandwiches completely from scratch–from the English muffins to the housemade cheddar-ancho beer cheese to the in-house ground & seasoned maple sausage patty. All of these ingredients are combined to make a melty, messy, delicious sandwich. Rubyzaar Baked bakes cookies inspired by some of their favorite tunes. The cookie menu includes the Midnight Train to Georgia, with peaches, pecans, maple and dark chocolate; the Ginger Baker with crystallized ginger, cranberries, and cinnamon; and the Keith Moonpie with burnt marshmallows, crushed graham crackers and dark chocolate. You’ll also find Rubyzaar at the Stand Coffee//Smorgasburg pop-up at the new Samsung 837 store in Chelsea. Stagg Jams, based out of Crown Heights, make small batch jams & marmalades, using seasonal fruit when possible. The Banana Jam is one of their most popular flavors. The brothers behind Tramezzini NYC, raised in Venice, Italy, make the Venetian specialty using bread and other high quality ingredients imported from Italy. Known in Hong Kong as gai dan jai, Wowfulls debuted at the winter Smorgasburg, where they’ve been wildly popular. 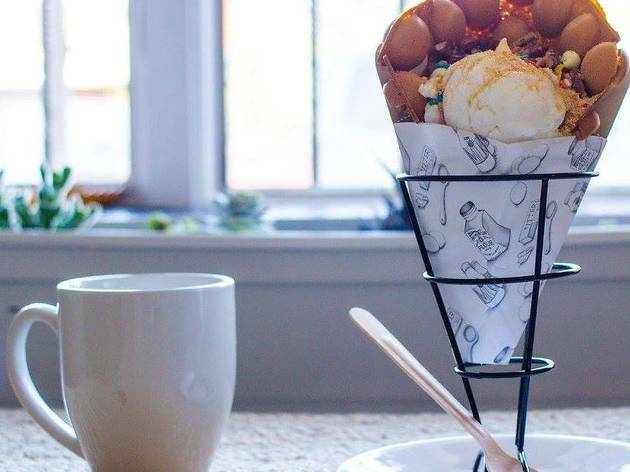 A Wowfulls pairs egg based waffles, made on a special machines imported from Hong Kong, with ice cream and toppings for a perfectly delicious (and very “Instagramable”) creation.